Ii either post too early or forget to post at all!!!! Our trip to Mandarin was relatively successful, I say relatively because there was one kid running up and down the restaurant and another sitting in a high chair, banging her feet and periodically emitting and ear piercing shriek. Really made our day. However, the food was good, as usual. I primarily went Japanese this time with the odd Chinese thing thrown in. They did still have some Moon Cake so I had a little of that and some super ice cream that I cannot remember the name of. I had some last time but still don't know the name. It is lavender in colour mixed with some white. We then collected the weekly shopping - new girl working there. Seems very capable. The click and collect manager is on holiday. When we came home and had finally put the shopping away, I decided to make the bean dish I posted the other day. Having done so, I realised we didn't need a heavy supper after our lunch so we had Cambazola Cheese and one of my heavy buns LOL. Will save the beans for tomorrow when I come back from the hospital. In case you don't remember, I am going for a CT Angiogram Wednesday afternoon. Not 100% sure what that is although I know they give you a dye. Not sure why I never thought of Googling before. This is what I got "CT angiography uses a CT scanner to produce detailed images of both blood vessels and tissues in various parts of the body. An iodine-rich contrast material (dye) is usually injected through a small catheter placed in a vein of the arm." I have had something similar before and I believe the dye upset me a bit. I just found out what CT stands for, Computed Tomography. 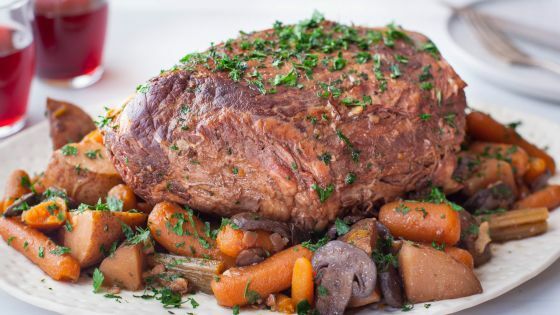 I just bought a roast and came across this recipe which I thought I might try. 1. Place beef roast in crock pot. 2. Mix the dried mixes together in a bowl and sprinkle over the roast. 3. Pour the water around the roast. 4. Cook on low for 7-9 hours. * Use onion soup mix instead of ranch. 6. Add one cup of red wine. 5. Add potatoes, carrots, mushrooms, celery and onion 2-3 hours before end. I hate that rush of heat you feel when they inject the dye. Good luck today! I don't remember that Denise, long time since I had it. Thanks. I hope everything went well for you at the hospital. The pot roast looks lovely. Not been yet - going about 8:15 p.m. your time Patricia. Thanks anyway. Good luck with your CT scan today! Hope all goes well. We love doing roasts in the crock, although Russell likes to put the veggies on the bottom and the roast on top. He says that it makes the meat too tough when it sits in the liquid for a long time cooking. We've had great success doing it that way. Hope the scan goes well and doesn't cause any ill feelings. Jo, hope all went well at the hospital and that they find nothing of concern. I love slow cooked pot roast, but my slow cooker is in storage!!! I'm a friend of Jo's and I don't know how else to let her blogger friends know that she is in hospital with some heart issues. We don't know much right now. She is having tests this afternoon (Saturday) but as it's the weekend we probably won't get results until Monday. We will try to set her up with internet by then. Thank you for posting this. I figured something was wrong and sent Jo an email today. Please keep us posted. Thanks for the update Ladydog.... I was dropping in to check on how the test went. Send her big hugs from all of us! Thanks for the update, ladydog. Please let her know we're thinking of her. Sending big hugs. Jo, where are you? Are you all right? I think this is the longest you've gone without posting in forever? Missing you! Jo has been in hospital. if you look back to ladydog's comments you'll be able to see what is happening. well, as you are aware, I have been lolling around in a hospital bed for 3 weeks. I am home now, feeling like a wrung out mop and unlikely to be writing much for a while unless the food they were giving me gives me the hebejeebees. Thanks so much all of you for your messages and good wishes. So glad to hear from you! Hope you are feeling better. I'm so glad to hear you're home again. Get better soon. Not a whole heap better i'm afraid, longish road ahead. Waterups, Senior Medications, Cooking, Dr. Who.